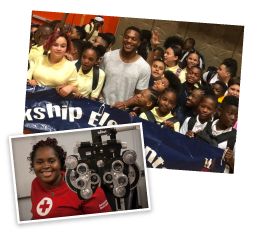 CF Charities is teaming with Rodney McLeod, Jr., Safety of the Philadelphia Eagles to launch the Healthy Attitude Initiative. Rodney traveled to regional schools to speak on his personal struggles of seeing the board in class as a student. Recalling the embarrassment to let his parents know, he understands the difficulties children face to obtain the needed health services to thrive in school. The Healthy Attitude Initiative is powered by the Student Health Impact Project and coordinates and facilitates dental, vision and on-location medical services for young people where they live, learn and play. CF Charities supports this work through educational programs, wraparound support, and community engagement. This tour will travel to schools to help increase awareness of healthy habits and education.